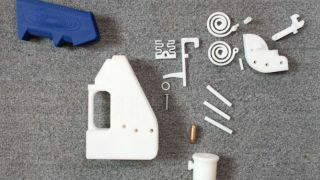 Build a 3D firearm, the blueprints which have been downloaded 100,000 times in two days, and the U.S. federal government comes knocking. At least that's what happened to Defense Distributed and its founder Cody Wilson. On Monday, the Distributed team posted blueprints for the "Liberator" handgun and by Thursday the State Department Office of Defense Trade Controls Compliance had something to say about it. The feds actually wanted files for it and nine other 3D-printable firearms components pulled from the web, at least until it can review whether the files fall in line with the International Traffic in Arms Regulations (ITAR) - a set of export control laws. Wilson told Forbes he has no choice to comply, though that may not do much to remove the instructions for the Liberator, silencers, sights and other parts from the net. According to Forbes, the gun files were being served by Kim Dotcom's Mega, and we all know how Dotcom feels about the U.S. government. It isn't clear if the files will be removed from Mega. What's more, files have also been uploaded to Pirate Bay at least "several times." There's currently a red banner across the top of defcad.org, Defense Distributed's website, that reads: "DEFCAD files are being removed from public access at the request of the US Department of Defense Trade Controls. Until further notice, the United States government claims control of the information." Wilson asserted Defense Distributed is within its rights to publish the files as, he says, it's excluded from ITAR regulations thanks to "an exemption for non-profit public domain releases of technical files designed to create a safe harbor for research and other public interest activities." You can read the full, jargon-filled letter here, but the outcome of the State Department Office's review raises serious questions about gun laws, internet protections and government oversight in the digital age. While 3D printed gnomes are one thing, guns are a whole other ballistic ball of wax.